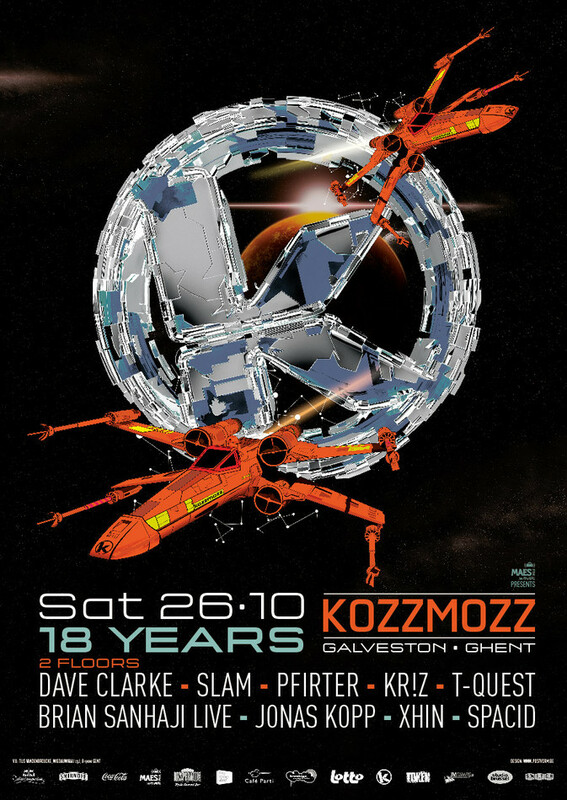 18 years ago the Kozzmozz aliens established an exploration base on planet Earth. It became a place where they voyaged through all the realms of that futuristic music called techno. And since they can't let this special event go by uncelebrated, the crowd will get even more spaced out than usual on this B-day edition: we will deliver them twice as many artists from around the solar system than on a regular visit and in a different base as we have set our beams on the industrial Artcube/ Galveston compound. We will bring it to astronomical techno heights and open doorways to places beyond everyone’s earthly imagination! To achieve this goal we are transporting the very best techno artists from around the globe to that little town with the ancient towers. They will be set free before our loyal visitors to show them just how mind-expanding techno can really be and to unleash their ultimate techno power onto the crowd. Commander in chief will be no one less than Dave Clarke who was catapulted to intergalactic fame with his groundbreaking ‘Red Trilogy’ as early as 1994. He cemented this position further with the album ‘Archive One’ which became a high standard in the earth’s techno archives. Add to these albums as ‘The Devil’s Advocate’ on Skint and ‘Remixes and Rarities’ on Music Man as well as numerous mixes and remixes. More recently he teamed up with Mr. Jones as Unsubscribe, again remixing the upper classes of the techno world. He also returned solo and re-released ‘Wisdom of the Wise’ (Red 2) through Boysnoize Records earlier this year. He also still runs his radio show ‘White Noise’ on airwaves across the globe and hosted his own stage on that astronomical sensation called Tomorrowland for the second year in a row. Next up are commanders Orde Meikle and Stuart Mc Millan of the Slam formation. They started their techno explorations with the legendary Soma label over 20 years ago and haven’t slowed down since, on the contrary. They were nominated by Mixmag as ‘Greatest Dance act of all times’ in 2011 and have in the meantime launched a new label called Paragraph and releasing tracks on Planet E, Figure, Ovum and Drumcode. Many of their current remixes and singles were gathered and spread out on the ‘Collecting Data’ album on Soma last year. They will get the full tactical support of Pfirter, nowadays considered Argentina’s biggest international music projection thanks to releases on CLR, Stockholm Ltd, Figure, Synewave, Stroboscopic Arte-facts, Apnea and his own Mind Trip Music imprint. The K aliens have also managed to awaken T-Quest who used to lead their techno platform in a big way but was abducted by another alien in recent years. Resident Kr!z completes the line-up in our first galaxy. But there’s more, because as we told you, this time we will present the crowd with two different galaxies. The commanders in this galaxy may not have reached the far-out statuses of our commanders in the first galaxy but that doesn’t mean that they won’t in the future. Because the Kozzmozz aliens are known for their futuristic visions as much as the artists they search out. First up on DS 7 is Brian Sanhaji of CLR fame on which he brought out his debut album ‘Stereotype’ as well as various EP’s. He also runs two imprints himself, Enable Recordings and Sonata music. He will bring his quests in techno-land completely live. His right hand will be Jonas Kopp from Argentina who started his career on the above mentioned Pfirters label and flew on to labels as Curle, Stroboscopic Artefacts and leading Ostgut Ton. He’s a favorite on that other exploration base, hailed by many earthlings with an appetite for techno, namely Berghain in Berlin. And coming from completely the other side of our little planet finally is Xhin from Singapore. His debut album ‘Supersonicstate’ was right up our system and now that he’s been picked up by Berlin’s Stroboscopic Artefacts and our own resident Kr!z’ Token label, we just had to make him intergalactic too. These internationals will be welcomed by our very own Spacid, a funky green alien turned into a true cosmonaut by the K-team. The Artcube base will be turned into a huge spaceship with overwhelming sound and visual stimulation in many forms and colors. You will definitely feel as if you are free flowing through hyperspace and the only thing that will be able to hold you back is yourself. The supersonic techno space flight will depart half an hour earlier and end an hour later … so, dear earthlings, let's celebrate the cosmic dance and surrender to the true masters of the universe! We await you with big anticipation … the peace loving inhabitants of planet K!